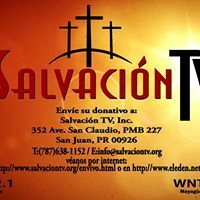 Religious TV Channel / Salvacion TV is a new secular Adventist channel with the mission of communicating the message of salvation in Christ, Jesus, to anyone who does not know him. Salvacion TV arrives in the east area of ​​Puerto Rico on frequency 22.1 and 36.1 west, free of charge, through a traditional air antenna (such as those that are placed on the roof of houses or outside the windows). The programming of Salvacion TV is based mainly on preaching, studies and biblical reflections and health issues. Salvacion TV broadcasts 24 hours a day, 7 days a week. Some of our programs include a review of the biblical school lesson, Revived by his Word (reading and reflection of a chapter of the Bible a day), Written this, What the Bible says about ..., health issues and Open Clinic , a recognized program that deals with health issues and disease prevention, following the biblical advice. In the short time that we have been transmitting, the programming of Salvacion TV has impacted the lives of different people, many of whom are going through very difficult situations. Their testimonies keep us in the fight.